Ashburton Grove - Arsenal news and Arsenal opinion: Wenger to spring a surprise by handing Chamberlain and Frimpong Newcastle start? Wenger to spring a surprise by handing Chamberlain and Frimpong Newcastle start? Arsene Wenger has choices to make with his team for this afternoon's clash with Newcastle. Without the soon to be departed Cesc Fabregas and Samir Nasri available to him, the Frenchman will have to decide who will take their places in the team. With Wenger reporting Robin van Persie and Kieran Gibbs were set to face late fitness tests at his press conference yesterday, the pair might be short of fitness for the game. Wenger has included new signing Alex Oxlade-Chamberlain in his squad and the passport forgetting Emmanuel Frimpong has also joined up with the traveling first team. With Theo Walcott returning to fitness following his ankle injury sustained in Germany, I wonder if Wenger might spring a surprise and include the 17-year-old Oxlade-Chamberlain from the start in place of the senior England international. I expect the other place in the team to be decided over who plays alongside Alex Song in the deep lying midfield role. Emmanuel Frimpong and Tomas Rosicky will be the contenders here, with the experience of the Czech international likely to get him the nod to start. Aaron Ramsey will take his position in the side after overcoming an injury scare in midweek, behind central striker van Persie. 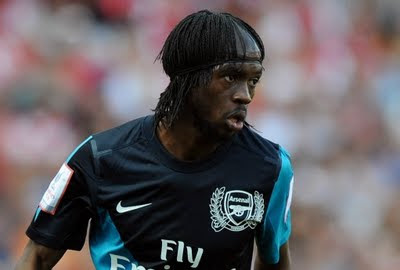 Samir Nasri's resident position on the left of attack is likely to be taken by new signing Gervinho who has impressed on the left during pre-season. Once the official team line up is announced, I'll bring it to you. A new feature for this season. I'll be wagering a small amount on the team each game, hopefully winning more than I lose! I'm going for an Arsenal 2-1 win at 9/1 with Betfair. Remember to join us for live blogging action of Newcastle v Arsenal. Set yourself a reminder below.